Roasting is a quick, easy way to sweeten the flavor of both the Brussels sprouts and cauliflower through carmelization. Preheat oven to 400 degrees, using the convection setting if available. Otherwise, raise oven rack to high position. Heat large, well-seasoned, cast-iron frying pan over medium heat. 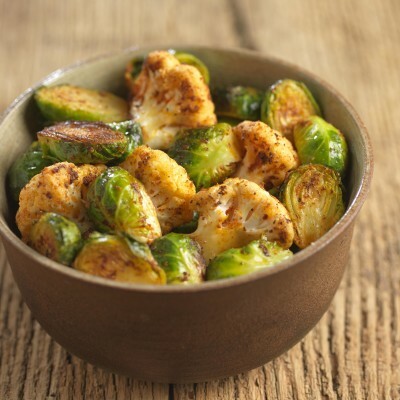 In a medium bowl, toss Brussels sprouts and cauliflower with olive oil to coat. Add paprika, garlic powder, salt and pepper and stir to distribute evenly. Pour the vegetables in the hot skillet, turn off flame, and place pan in oven. Roast for thirty minutes, stirring every ten minutes for even carmelization.